RealtyTrac® recently released its U.S. Home Equity & Underwater Report for the first quarter of 2015, which shows that at the end of the first quarter of 2015 there were 7,341,922 U.S. residential properties seriously underwater — where the combined loan amount secured by the property is at least 25 percent higher than the property’s estimated market value — representing 13.2 percent of all properties with a mortgage. 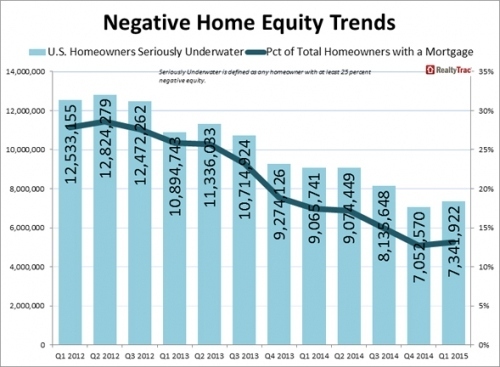 The share of seriously underwater homeowners increased 0.4 percentage points from Q4 2014 — the first quarterly increase since the second quarter of 20120 — but still down more than 4 percentage points from a year ago. “At the end of 2014 we saw the lowest share of seriously underwater properties since we began tracking such data, but in the first quarter that share bumped up slightly as home price appreciation continued to slow down in many markets,” says Daren Blomquist, vice president at RealtyTrac. 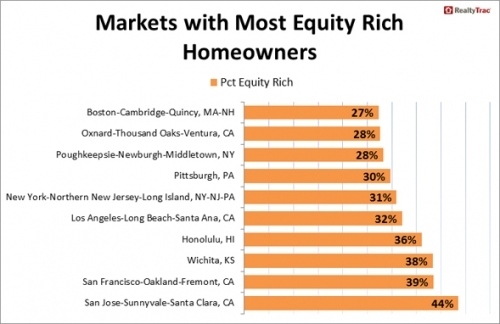 “In addition, the data indicates more owners who have regained equity listed and sold their homes in the first quarter, cashing out on some of the home equity on the table in the U.S. housing market. The biggest change in the equity landscape nationwide was in the category of homeowners with between 20 and 50 percent equity, which saw a net decrease of nearly half a million between the end of the fourth quarter and the end of the first quarter. “Meanwhile most of the seriously underwater homeowners are still stuck in their homes as short sales and other foreclosure alternatives lose momentum, tilting the national home equity scales back slightly toward a higher share of negative equity,” Blomquist added. 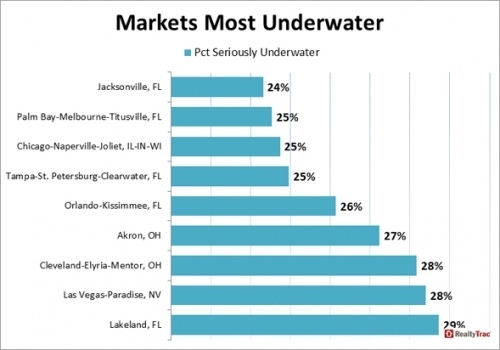 Markets with the highest percentage of seriously underwater properties in Q1 2015 were Lakeland, Florida, (28.7 percent), Las Vegas (28.4 percent), Cleveland (28.2 percent), Akron, Ohio (27.2 percent), Orlando (26.1 percent), Tampa (25.0 percent), Chicago (24.7 percent), Palm Bay, Florida (24.5 percent) and Jacksonville, Florida (24.3 percent). Markets where the share of distressed properties — those in some stage of foreclosure — that were seriously underwater exceeded 50 percent at the beginning of 2015 included Las Vegas (57.6 percent), Lakeland, Florida (55.1 percent), Cleveland (53.1 percent), Chicago (52.6 percent), Palm Bay, Florida (52 percent), Tampa (51 percent) and Jacksonville, Florida (49.4 percent). The share of equity rich U.S. residential properties with at least 50 percent positive equity at the end of the first quarter was 19.8 percent. This is down slightly from Q4 2014 at 20.3 percent, but up 0.2 percentage points from the first quarter of 2014. As of the end of the first quarter, 35.1 percent of all properties in some stage of foreclosure were seriously underwater, up 0.5 percentage points from the 34.6 percent seriously underwater in the fourth quarter of 2014, but still down from 45.0 percent seriously underwater in the first quarter of 2014. 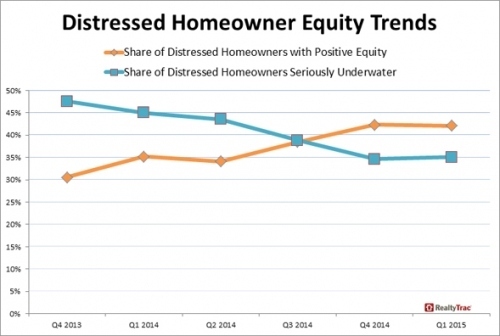 The share of distressed properties — those in some stage of foreclosure — with positive equity (42.1 percent) surpassed those that were seriously underwater (35.1 percent) in the first quarter, continuing the trend from previous quarter. Those states with the highest percent of distressed properties with positive equity included Colorado (76.1 percent), Oklahoma (69.8 percent), Texas (68.1 percent) and Minnesota (67.9 percent) and Louisiana (63.8 percent). Major markets where the share of distressed properties with positive equity exceeded 60 percent included Denver (84.1 percent), Austin (82.5 percent), San Jose (76.9 percent), Honolulu (76.1 percent), Pittsburgh (75.3 percent), McAllen, Texas (74.6 percent), and Buffalo, New York (74.0 percent). When breaking out loans by property type, single family homes were at 11.9 percent seriously underwater, while condos came in at 16.6 percent and multi-family homes with 21.8 percent of properties seriously underwater. For distressed properties 42.6 percent of condos were seriously underwater, followed by single family homes at 34.8 percent and multi-family homes at 30.4 percent seriously underwater. The percentage of loans seriously underwater were higher for loans originated during the housing bubble years of 2004 to 2008, with 38 percent of all loans originated in 2006 seriously underwater — the most of any loan vintage, followed by 2007 (33 percent), 2005 (30 percent), 2008 (23 percent), and 2004 (21 percent). Among properties that were owner-occupied, 20.7 percent were seriously underwater, while 11.0 percent of non-owner occupied homes were seriously underwater.